Serving the orthotic and prosthetic community for over 30 years. 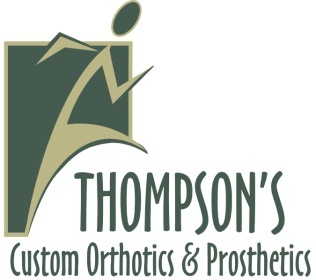 Thompson's Custom Orthotics and Prosthetics was founded in 1985, beginning a long tradition of providing our patients the highest level of care, quality of product, and participation in the team healthcare approach. We are proud to offer three convenient locations throughout the Inland Northwest, including inpatient services to local hospitals and nursing homes. Thompson's is a leader in cutting edge O&P technology and prides itself in offering certifications in emerging innovations in the field. Today our practitioners offer a broad background in expertise to provide you an innovative and custom experience, unparalleled in the Inland Northwest.